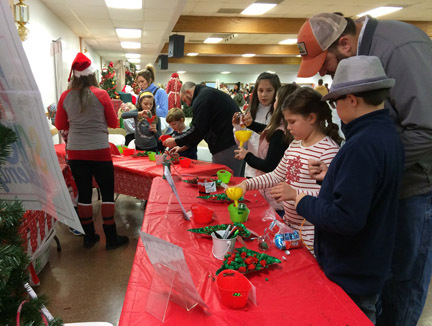 Over 400 people (including 209 children) attended the Third Annual New Melle Country Christmas celebration Nov. 24th at New Melle Sports and Recreation. 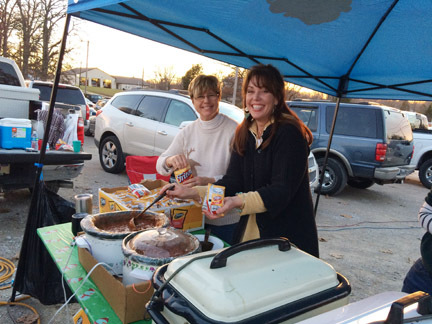 The festivities started outside with free refreshments and activities sponsored by area businesses and organizations. 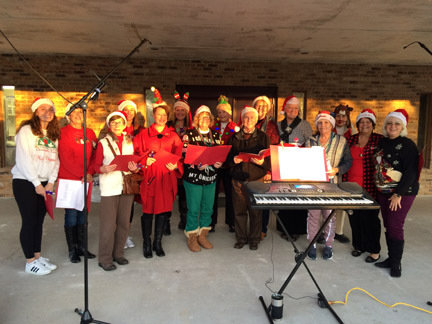 A community choir, directed by Donna Curdt, sang an array of delightful holiday songs, and 500 luminaries, surrounded the property and lit the pathway to the parking lot. 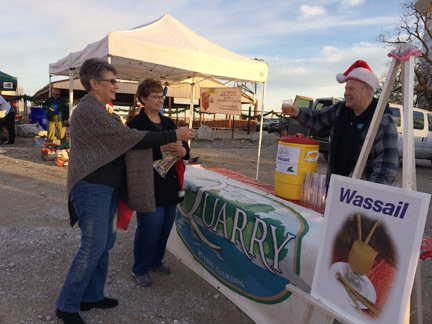 Those who attended enjoyed Wassail sponsored by The Quarry Wine Garden, hot dogs and walking tacos sponsored by Catala Facial Retreat and Boutique, Joerling Bros. Trucking, Karrenbrock Construction and Fireside Bar & Grill. New Melle Dental gave out free popcorn, and Fridley Chiropractic provided free beer for the adults. 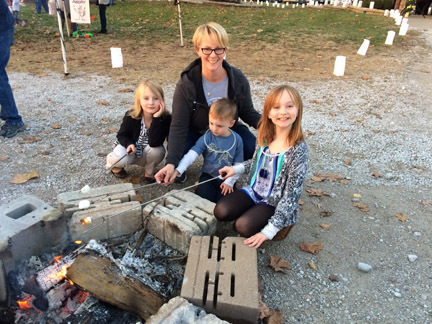 The Boone Country 4-H club assembled the luminaries, gave away hot chocolate and had a craft for the kids. 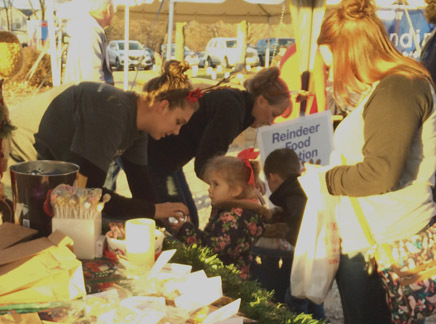 Peoples Savings Bank helped the kids make reindeer food. Grace Hauling sponsored a juggler. Blondin Professional Real Estate sponsored a styrofoam noodle toss and a large tent for people to gather under. 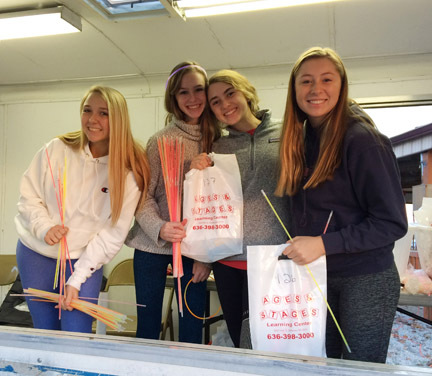 Ages and Stages Learning Center donated the registration bags that each child received, plus the ingredients for S’mores (assembled by the Daniel Boone Elementary “Raccoons Giving Back” volunteers – and assisted at the fire pits by volunteers from Friedens UCC.) Inside the registration bags were items donated by Ages and Stages Learning Center, Little Lamb Child Care and Learning Center, Friedens United Church of Christ, and Catala Facial Retreat and Spa. About 5:15 Santa and Mrs. Claus arrived by fire truck for the official lighting of the Community Christmas Tree. 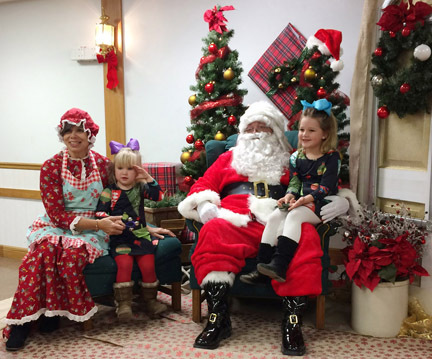 Inside, children visited with Santa and Mrs. Claus (Great job Paul Reese and Janet Hespen! 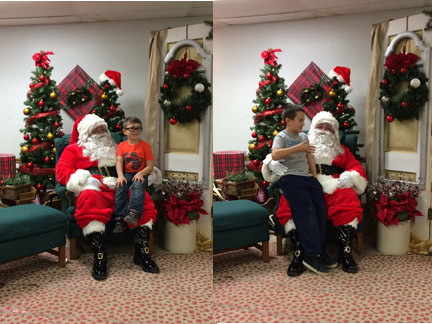 ); wrote letters to Santa (sponsored by Short Stop’s) and mailed them in a special mailbox donated last year by Work Horse Construction. The mailbox will be at the New Melle Post Office until Christmas. Some also colored holiday scenes that will be displayed at area businesses during December. St. John’s UCC Mary and Martha’s Circle gave out treats; and the City of New Melle provided cookies and punch (served by Girl Scout Troop 2495.) 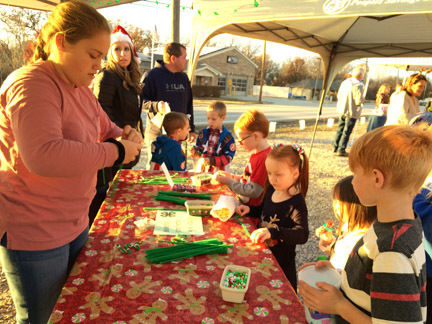 Player 21 Sports and other volunteers hosted a cookie decorating table; and Pocket of Preschool had an ornament making station. Both were both quite popular. 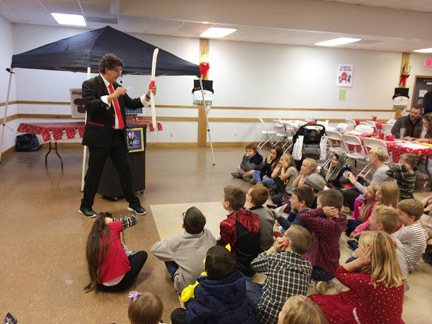 As always, the magic show by Leland and Whiskers (sponsored by A & S Septic) and the Balloon Artist from Premier Entertainment (sponsored by Immaculate Heart of Mary Church) were both huge hits. 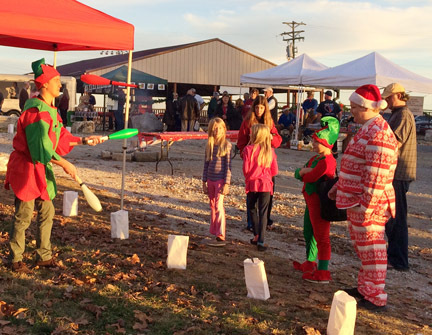 Straatmann Feed donated sand for the luminaries and ingredients for the reindeer food. Luke Blondin and friends set out the luminaries. The beautiful stage was decorated by Carla Skouby-Brakensiek and Janet Karrenbrock. 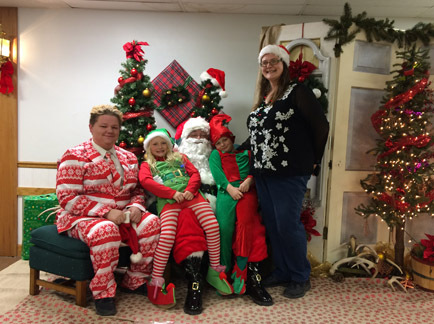 Little Lamb Child Care and Learning Center donated elf costumes for the volunteers. 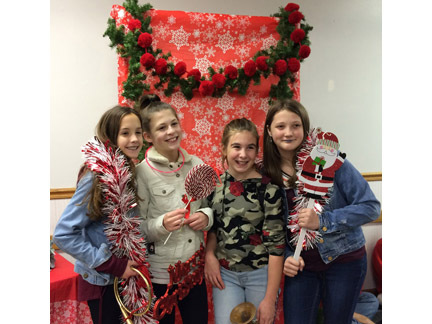 Catala Facial Retreat and Pocket of Preschool Academy sponsored a photo backdrop with props for taking holiday pictures. 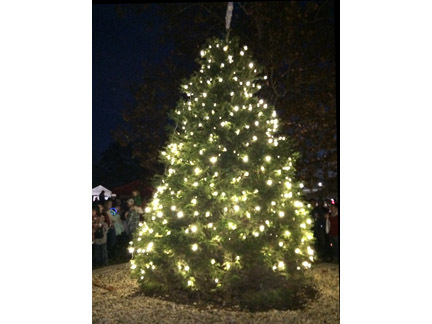 Matt Joerling and Lamping Electric decorated the gorgeous Christmas tree out front. 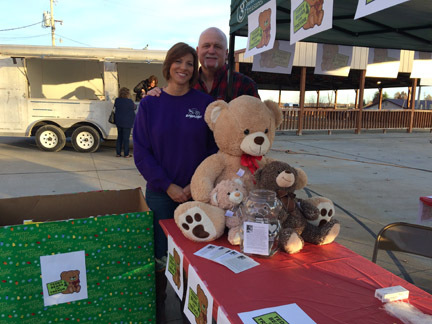 Teddy Bears for Trevor: Seventy-five stuffed animals were collected for Teddy Bears for Trevor, plus $130 cash. Teddy Bears for Trevor honors the memory of Trevor Joerling who lost his battle with Hodgkin’s Lymphoma in June, 2014 at the age of 16. His mom, Brandee said, “When Trevor was rushed into the hospital he was given a handmade teddy bear and the bear provided such a sense of comfort to him during an unimaginable time. That sparked Trevor’s mission for Trevor’s Teddy Bears. We are so glad to see this teddy bear drive grow through the years...We thank our community for the unconditional love and support. We will take the animals to St. Louis Children’s Hospital for children undergoing treatment. The money will be donated to the Child Life Services to be used to support the care given to the hospitalized children.” The Joerling family volunteers each Christmas morning at Children’s Hospital in St. Louis, delivering gift bags to any newly admitted patients that were not expecting to be there on Christmas morning. Each gift bag includes a teddy bear or stuffed animal. 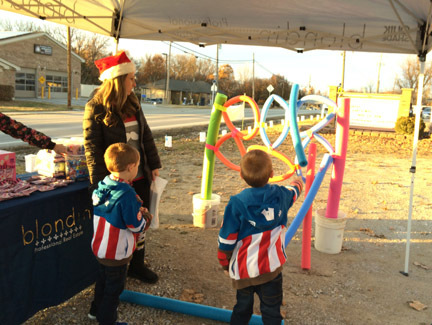 Freeze Out: A new activity this year was a “Freeze Out” sponsored by Overstock Outlet in Wentzville. 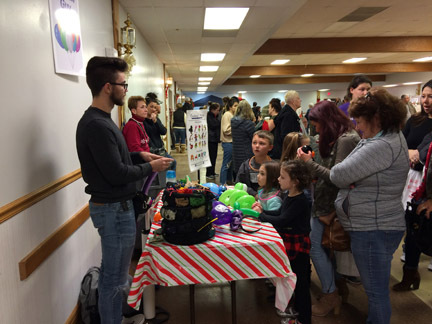 Approximately 450 canned goods, four boxes of clothing and $20 cash were collected for the needy as part of that event. Thank you to everyone who supported these two causes! The Community Choir sang a wonderful variety of holiday songs. Ages and Stages Learning Center and assisted by Friedens UCC. with event co-chair Maureen Blondin. The amazing juggler, sponsored by Grace Hauling. by A & S Septic. It was a huge hit with the kids. Decorating cookies - sponsored by Player 21 Sports. 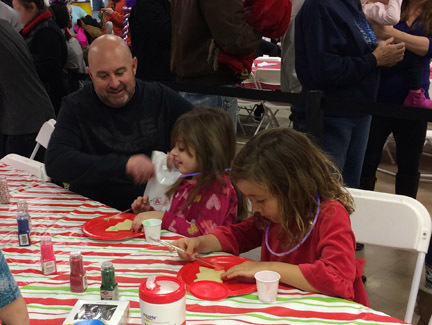 Making ornaments - sponsored by Pocket of PreSchool Academy. 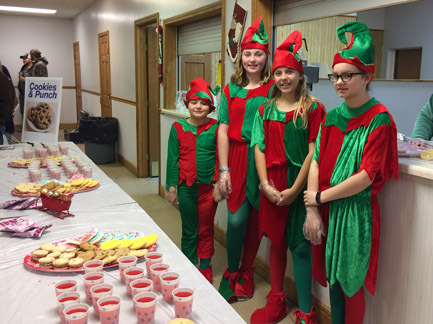 cookies and punch sponsored by the City of New Melle. Pocket of Preschool Academy and Catala Facial Retreat and Boutique. Immaculate Heart of Mary Church. Child Life Services to be used to support the care given to the hospitalized children. Thank you to everyone who supported this cause! collected 450 canned goods, $20 cash, and 4 boxes of clothing for needy. Thank you to everyone who supported their efforts! Karrenbrock Construction and Fireside Bar & Grill. 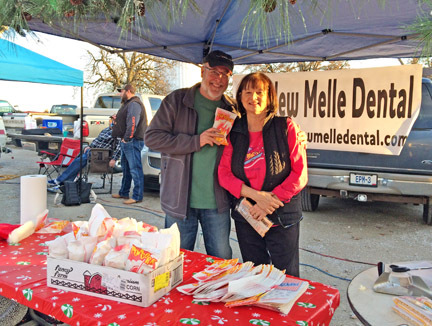 Dr. Paul and Cheryl Moore - New Melle Dental - sponsored the popcorn booth. 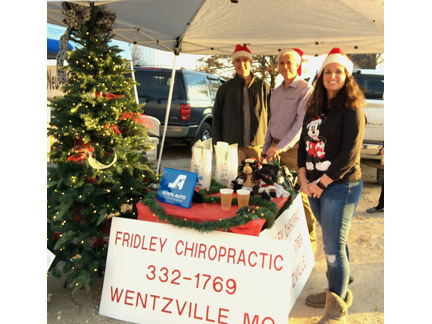 Fridley Chiropractic gave away free glasses of beer. from Hank Podgorny - Quarry Wine Garden. provided a craft, and assembled the luminaries. Reindeer food...with ingredients donated by Straatmann Feed. and passed out the registration goodie bags. and worked the registration booth. Thank you!!! 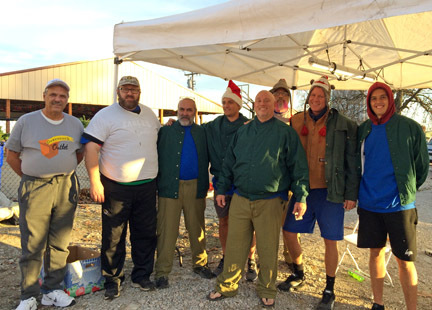 Friday and Saturday to help pull off this event -- and then stayed late to clean up! provided by Wind Ridge Farms. 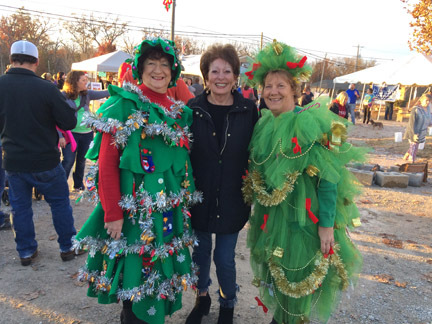 We are so fortunate to live in such a generous and dedicated community!